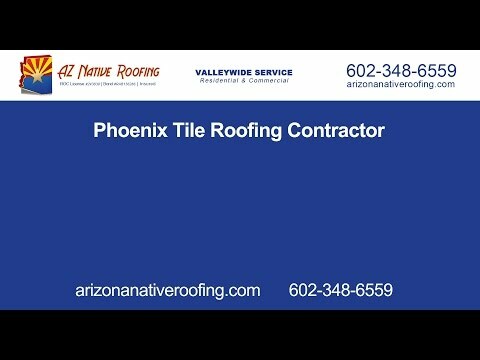 Arizona Native is your Tile roofer of choice for residential and commercial roofing services in Phoenix and surrounding cities! The beautiful capital of Arizona, Phoenix, is a great place to call home or to visit. Months of sunshine, beautiful weather, breathtaking desert scenery, NASCAR races, the best golf in the Southwest and a rich history make it a favorite with residents, tourists, and visitors alike. While the sun is shining most of the year, the monsoon season will inevitably come. During that time, it is essential that your roof is in top shape to keep out wind, dust, dirt and-most importantly_ the oodles of rain that are coming with it. The experienced roofing crew with Arizona Native Roofing knows that a perfectly maintained roof is a must and tile roofs make a great choice for homes and businesses in Phoenix. Tile roofs have been around for centuries, and for good reasons. They look great, last forever and have many beneficial properties such as offering great insulation, which tremendously lowers your cooling bill. A professionally installed Phoenix tile roof will save you a bundle of money by being virtually indestructible and by creating a great climate inside your home. All you have to do is to perform roof inspections once in a while, or contact your local roofing professional for an in depth assessment of the health of your tile roof. While a tile roof is extremely durable, a fierce haboob may rip some tiles of your roof and cause leaks. Leaks are never a good thing to have, because they can cause a huge amount of damage, not only to your roof, but your entire building structure. Arizona Native Roofing offers Phoenix tile roof and emergency roof repair services, for when you need us most. We understand how crucial a well-maintained roof is for your home and your family, as well. And you never need to worry about looks, we can match new tiles to your existing roof. If you are in need of a new tile roof or are looking to upgrade your shingle roof, our team can help. When upgrading, we can check if you current building and roofing structure is strong enough to support tiles and if need be, we can strengthen it for you. We can replace underlayment, as it is often cause for Phoenix tile roof leaks, or reroof your roof completely if you are going for a new look. A new tile roof is a significant investment and by having it installed by a PHX roofing professional and maintained on a regular basis, you are making sure it will last you for years. No matter if you are looking for someone who knows Phoenix tile roofs and offers quality roofing services at affordable prices, or if you need assistant with a shingle roof leak, our team of roofers can help you out. Arizona Native is your roofer of choice for residential and commercial roofing services in Phoenix and surrounding cities. Contact us today at 602-348-6559 for more information about our services, a free quote or to schedule a consultation.